The Adventures & Travels of RoadAbode: Spring is Here! 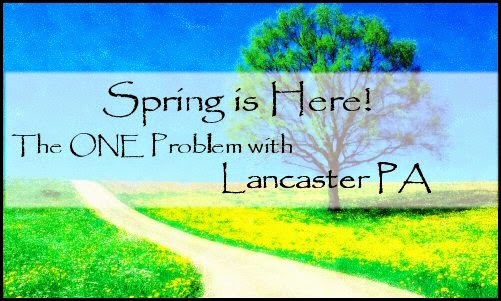 Want to Know the One Problem with Lancaster PA? Spring is Here! Want to Know the One Problem with Lancaster PA? The snows have melted, and the RoadAbode Crew is getting ready this week to go on our first RoadAbode weekend trip of the season. Each year we usually head somewhere in Pennsylvania. Sometimes it's to the horse country and gardens found in the Brandywine Valley. Other March trips we've spent in parks found in the Pocono Mountains region. Most March trips though, we spend in the Lancaster PA region. For us, Lancaster is a great "shakedown" trip. A shakedown trip for us means a relatively short drive to let us ease RoadAbode back into duty after basically a three month rest. Lancaster is perfect not just because of all the attractions, but also it's only an hour from where we keep RoadAbode, and the campground we stay at is accessible by major routes. If it's cold enough to freeze, the campground has shower and restroom with heated floors - which is a plus. We love Lancaster, but there is a problem when we go. There's such a diverse amount of things to do! We love to get away to relax, and at our top Lancaster campgrounds, we do that very well. But... have you ever felt guilty because you are relaxing - instead of taking part in all the unique, cool things to do in an area? Lancaster makes us feel like slackers! Maybe that's our problem and not Lancaster's. With four (and pup) as our base RoadAbode Crew in the past, someone is not going to be able to do what they want on our weekend trip out.. However, now that our girls are older, it is a little easier to figure out. We adults could drop our teen and twenty-something girls to the outlets for the morning (They LOVE Rockvale) and head out to the Mud Sales. Maybe the ladies want to sleep in and I'll go out visiting the Middle Creek Wildlife Area to witness the Snow geese migration. Or maybe we should all head to the Lancaster City Farmers Market - Central Market - the country's oldest farmers' market, in the heart of Amish country. The great thing is we want to go back and do things we've enjoyed in the past. The challenge is fitting in the cool new things we find in Lancaster County. No matter what interests you may have, you may feel that twinge of being a slacker on a weekend trip. Award winning theater? Check. Awesome dining (and drinking) spots? Check. Unique local shops? Check. History? Check. Art and Culture? Yep. Happening City Nightlife? They have that too! No matter what will get you up and off your duff relaxing on a weekend, Lancaster has it - ready to entice you out of your comfy reading chair by the campfire. It's almost unfair! We know the solution to our craziness. It's pretty simple. Spend more time in Lancaster! We'll be in Lancaster this weekend - First Weekend of Spring! We have plans to visit some local shops and enjoy just hanging out. If you haven't tried Lancaster County yet - you should! If you have - let us know in the comments below - what are your favorite things to experience in Lancaster County?